Naturally grown produce, picked fresh. All our produce is grown in rich black peat soil which gives it its superior taste. We amend our soil with compost which is produced from our own cattle on the farm. Crops are rotated yearly and we do soil samples to ensure nutrient levels are exactly where they need to be. Organic and commercial fertilizers are used in combination with the compost to ensure nutrition and quality in the produce we grow. We pick it fresh to ensure the best quality; our produce has a taste that speaks for itself. 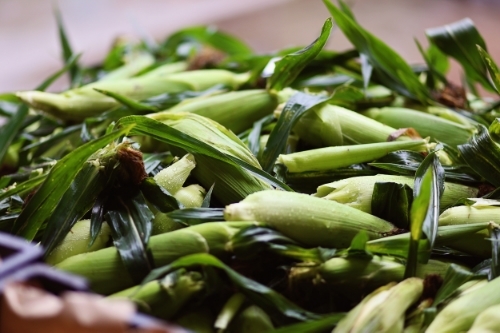 Except for the sweet corn, all the produce is free from commercial pesticides. We use organic methods of weed control such as flame weeding, cultivating, and hand weeding. We eat what we grow and wouldn't eat it if we didn't trust it! One of the features on our farm is our Non-GMO SWEET CORN, our customers favorite! All our corn is picked within a few hours of purchasing. Our customers always compliment us on how much sweeter it is than the rest. People come from all over to purchase some of the best corn they have ever tasted! We sell our produce from our farm and at a variety of farmers markets throughout the year, and we offer our Localicious Produce Box every summer, fall, and winter. Come on down for a visit, we'd love to see you!